You beauty is a line that Bill Lawry uses more often. Ravi might have picked it from him. Forget about Ravi. Let me come to the main Topic. I am gonna use that word You beauty for this post. I couldn't think of any other word when I thought of writing this post. Spend time on each photo for at least a few seconds and then say "You beauty" before you proceed to the next photo. Do you remember this photo? Three year old Sachin announcing to the world about his future. The Hook shot that he played against Caddick in the world cup is my all time favorite Sachin shot. The reaction time was so less and the manner in which he hooked the ball out of the ground made me go bonkers when I watched that match. The West Indians are known for their hook shots. But If there is one batsman who could even make the West Indians to stop and learn a trick or two about the hook shot, it has to be the Little Master. Sachin fans would never forget the two thundering straight drives of Brett Lee. The greatest way to insult a fast bowler is to hit one past him. Sachin knows that trick and he does that in every game. 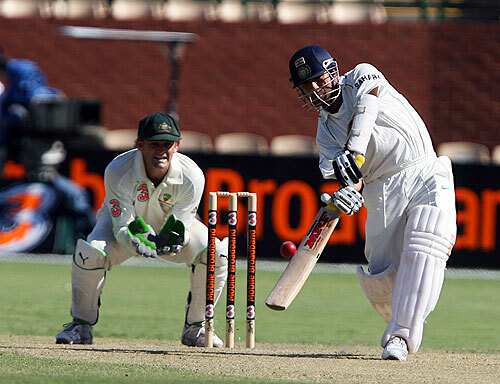 If there is one batsman in the world who plays this shot exactly as it is written in the cricket manual, it is Sachin. 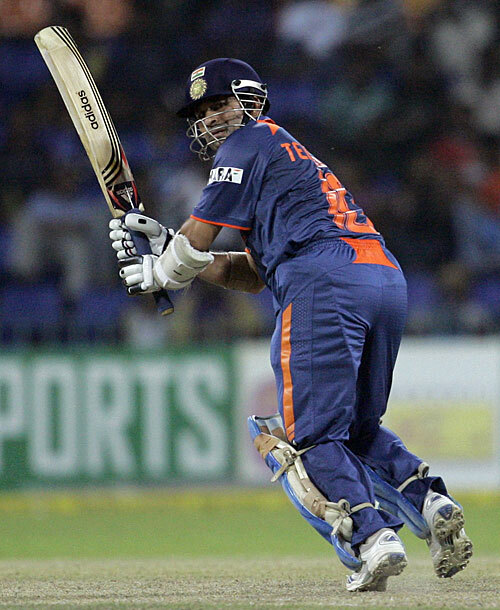 His first match as an opener against the Kiwi's enabled him to unleash this special weapon and the world saw the talent hidden in the form of Sachin. Thanks Navjot Singh Sidhu for the opportunity that you gave to the Little Master. Sehwag and Tendulkar are the greatest exponents of this art. Pakistan was at the receiving end when two of the greatest upper cuts of all time were effected on them by the Indian openers in the ICC World cup. Waqar and Akthar were at the receiving ends. Parthiv Patel also tries this cut on various occasions only to be caught inside the 30 m circle. Not one of the greatest runners between the wickets. But it is a treat to watch him running between the wickets. He has run more than any other cricketer in this world. You beauty. Place five fielders on the boundary and still he can find a gap between them. Such is his strength on this area. You beauty. When he returned back to play a world cup game against the Kenyans after his father's death, Sachin used this shot more than once . He even used the reverse-paddle sweep on his way to his hundred. That was an emotional innings. You beauty. He started his bowling career as a medium pace bowler. He has even opened the bowling attack for India. Then he chose leg spin and in one match against the Aussies in Kochi, he spun the ball a mile and ended up getting 5 wickets in that match. How can one forget the famous googly ball that Moin Khan missed? You beauty. There was a period in Indian cricket, when Sachin got out, the entire batting order would collapse. This was the fate of the Indian team in the late 90s. Now the Indian team has great talents in the form of Sehwag, Dhoni and Yuvi. But Sachin is still the backbone for the Indian team. It is very evident in this world cup. How many times have we seen this spectacle? He will do it yet again for his 100th International 100. That's gonna be a moment which will give us an opportunity to say "You beauty" once again. None of us would admire a batsman when he gets out. But Sachin is an exception in this too. He walked tall even when the umpire gave him not out. Cricket is still a Gentleman's game. 449. Do you remember us?